Engagement and wedding rings come in a huge array of styles and material. When shopping for engagement and wedding rings, many couples go together — or at least pre-shop together so that each person has an idea of the other’s taste. When choosing rings, consider your lifestyle and price range, and determine what’s most important to you by prioritizing the 4 C’s. The stone you choose for an engagement ring can be anything you wish — emerald, sapphire, ruby, or topaz, for example. But the most popular stone is diamond. A diamond is the hardest transparent substance known to man, one hundred times harder than ruby or sapphire. This durability, along with its light, has made diamonds an enduring symbol of marriage. They are evaluated and classified by the four C’s—cut, color, clarity, and carat weight. A diamond’s cut and proportion determine its brilliance and fire, making the cut perhaps the most important factor in a diamond’s beauty. Each facet acts as a light-dispersing mirror, so more facets generally mean greater beauty. A modern, round-brilliant-cut diamond has 58 facets, which makes it more brilliant than other shapes. 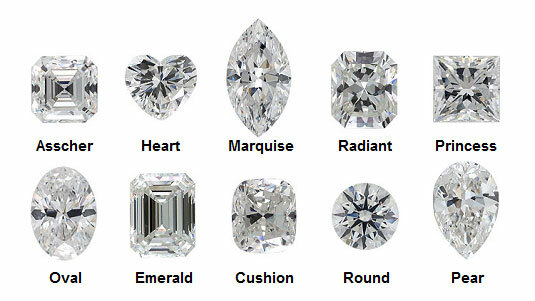 Diamond shapes (not to be confused with the cut). The Gemological Institute of America (GIA) grades color starting with the letter D (colorless) through the letter Z (progressively more yellow). In nature, diamonds occur in virtually every color and shade: blue, pink, lavender, yellow, green, red and even black. Colored diamonds are increasingly popular for engagement rings, and some rare colors are quite pricey. Internal imperfections, such as small cracks, whitish dots or dark spots, are called inclusions. External flaws are blemishes. Generally speaking, the fewer the inclusions and blemishes, the clearer and more brilliant the diamond, the rarer it is, and the more it’s worth. FL: Flawless, meaning without any surface characteristics or internal imperfections. Extremely rare. IF: Internally flawless with only minor external blemishes that a jeweler can polish away. An internally flawless (IF) diamond. VVS1 and VVS2: Very, very small inclusions that are difficult for a qualified observer to detect. VVS1 diamond with a very, very small inclusion. VVS2 diamond with very, very small inclusions. VS1 and VS2: Very small inclusions visible only under magnification. A VS1 diamond with very small inclusions. A VS2 diamond with very small inclusions. SI1 and SI2: Small inclusions that are readily apparent under magnification but not to the naked eye. SI1 diamonds have small inclusions seen with magnification. SI2 diamonds have inclusions spotted easily under magnification. I1, I2, and I3: Imperfect grades in which the flaws may or may not be visible to the naked eye. Much lower in price and generally don’t appreciate in value. Imperfect diamond grades, like the I1 here, have flaws that might be visible without magnification. 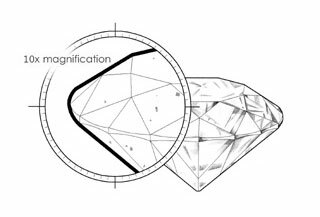 Gemologists measure the size of diamonds in terms of weight, specifically in carats. A carat contains 100 points. If a jeweler says a stone weights 25 points, it’s 1/4 carat. While size still matters, it is almost meaningless outside the context of cut, clarity, and color. A large stone that is dull, flawed, or improperly cut is worth less money than a perfect little diamond. Choosing the right setting for a diamond is like choosing the right frame for a picture. Classic settings include the prong-less bezel, elaborate carved scroll, clean-looking channel, decorative cluster, flush-lying gypsy, expensive invisible, glittery pavé, traditional prong, light-reflecting silver cups, singular solitaire, floating tension, and classic six-pronged. The metal of your ring should flatter your skin tone and the color of your stone. Platinum is the most expensive, but beautiful, and both hard and resilient. Whatever metal you choose, you may have the ring designed with a variety of finishes, patterns, or edgings. If you’re able to find an “under-size” diamond, which is a diamond that weighs just under a cut-off weight (for example, 0.95 carats instead of 1 carat; 0.45 carats instead of half a carat), you can save substantial sums of money for a diamond that looks, to the naked eye, essentially the same as a diamond that hits the larger cut-off weight. When it comes to white (non-fancy) diamonds, most consumers can’t tell the difference between diamonds on the very high end of the clarity scale (such as VVS1) and those lower on the scale, which contain very slight or slight inclusions (VS1 or SI1). In the case of many SI1 diamonds, for example, the flaws are only visible under 10X magnification, although the price difference between a VVS1 and an SI1 diamond is considerable. The same advice applies to a diamond’s Color Grade. A “D” or “F” diamond (colorless) can easily cost double the price of an “I” (near-colorless) diamond of the same cut, although most people can’t tell the difference between colorless and near-colorless diamonds. Consider buying a near-colorless diamond to get the most from your budget. Although platinum is a preferred ring metal, it is also the most expensive of the precious metals. White gold, on the other hand, is an excellent and affordable alternative to platinum and a great choice for the budget-conscious shopper. White gold has a stunning appearance and a white/gray patina that resembles platinum. White gold is also very durable, has a high scratch resistance factor, and does an excellent job of drawing attention to a diamond’s brilliance. Online retailers, such as James Allen, can save you 30–50 percent off the prices of traditional retailers. The tremendous selection at online retailers can help you find exactly what you want and stay within your budget. Buying online allows you to be in the driver’s seat — you can take your time and educate yourself about your diamond-buying options; you can avoid being persuaded by commissioned sales associates and instead can feel confident that your decision is the right one for you. Buying online is extremely convenient — some online retailers offer customer service 24/7 so you can shop wherever you want, whenever you want.